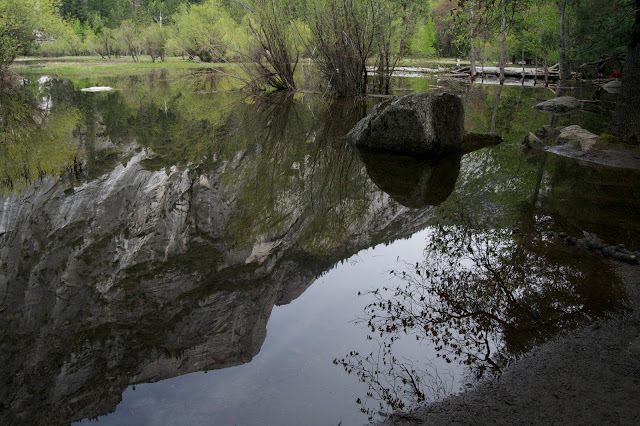 Growing up, I spent many weekends in Yosemite Valley with my family. And we still do an annual trip to Tuolumne Meadows in the summer. Early on in our relationship, Andrew started joining our family on trips and quickly fell in love with climbing, camping and exploring the Sierra Nevada. It has become one of our favorite things to do together. Way back in November, we decided that we should plan a camping trip to Yosemite Valley in the spring to see the wildflowers and enjoy the Valley before the summer crowds and heat. We picked a random April weekend and hoped for the best. 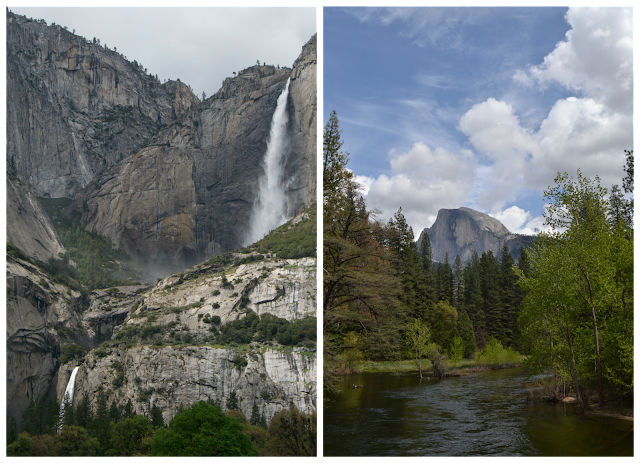 Although the weather forecast tried to deter us, we decided to continue with our plan and spent a long weekend in Yosemite. We were met with heavy rain on Friday, and spent most of the day in the Ahwahnee Hotel (I'm not on board with the new name) playing cards and enjoying a glass of wine by the fire. It wasn't ideal, but luckily it's a beautiful place to spend the afternoon. That evening, we went to a movie at the visitor center rather than sit in camp in the rain. It was a nice film highlighting the landscape of Yosemite and climbing. Andrew's sister, Nina, her boyfriend and another friend arrived late Friday night to join us. And thankfully Saturday was sunny and beautiful. 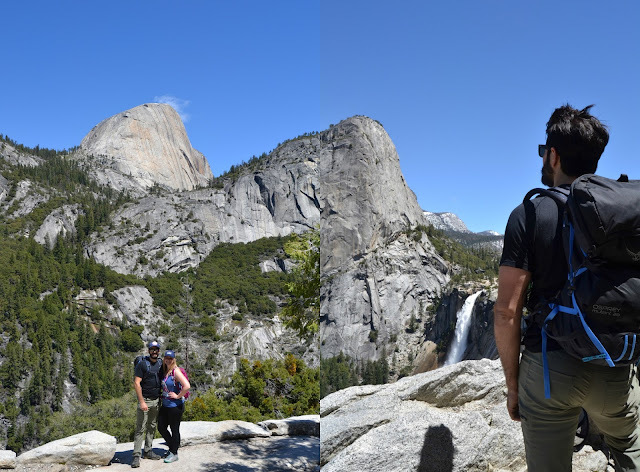 We decided to do a longer hike on Saturday and took the John Muir Trail to the top of Nevada Falls. We decided we had an enough of our rain jackets and didn't want to take the Mist Trail since the falls were so full, we knew it'd be a heavy mist. It was actually really nice to be on the Muir Trail because there were far less people. It was a nice hike, and we were rewarded with awesome views. On Sunday, we decided to do a shorter hike to Mirror Lake. I hadn't been there since I was young, but I was expecting more of a lake. 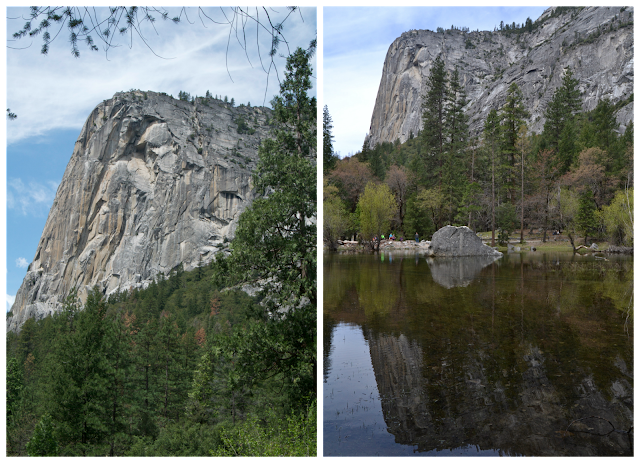 It's become a bit more like Mirror Meadow, but the granite wall reflections are still breathtaking. We explored the lake and walked around a bit before heading back to camp. We also did a little tour of the Valley since Nina and her friends had never been. We pointed out some climbers, visited the store, Curry Village and walked around to view Yosemite Falls, Half Dome and the beautiful Dogwood tree blossoms. It was a great trip despite the weather. 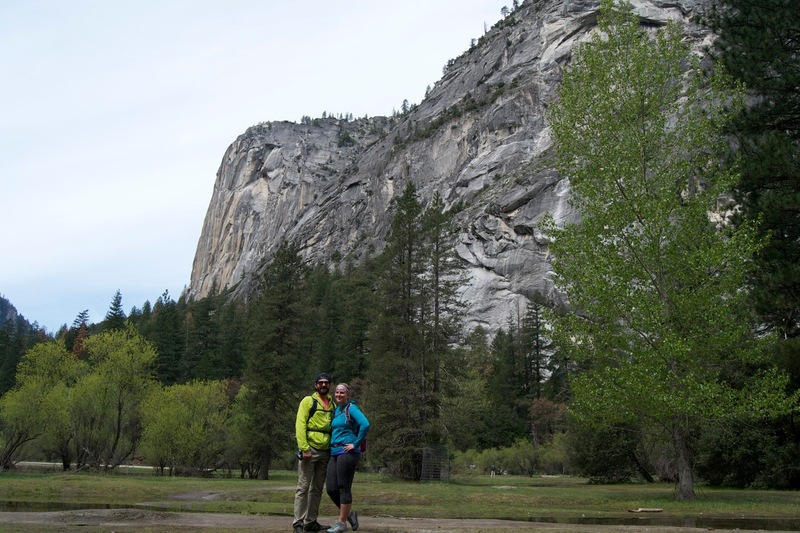 We're already trying to find another weekend to go back, and we have our annual family trip to Tuolumne planned for later this summer. Have you been to Yosemite? Do you like camping? I feel like most of my friends either love it, or really really hate it! I love Yosemite! I cant wait to take the kids when Henry gets a little bit older. Want to know something sad but true...I have never been to Yosemite! It's honestly embarrassing at this point. It's largely in part because we don't go hardly anywhere without Finn and dogs are not really welcomed in the park. Boo! PS time to update your side bar Mrs!! Your pictures of Yosemite always look so beautiful to me. Sorry you got rained on but it still sounds like a fun tirp. I used to camp in Yosemite every summer as a kid. That was our family vacation and I miss it so much! I haven't been back in a few years. Definitely time to plan a trip this summer! Whoa! These photos are spectacular. 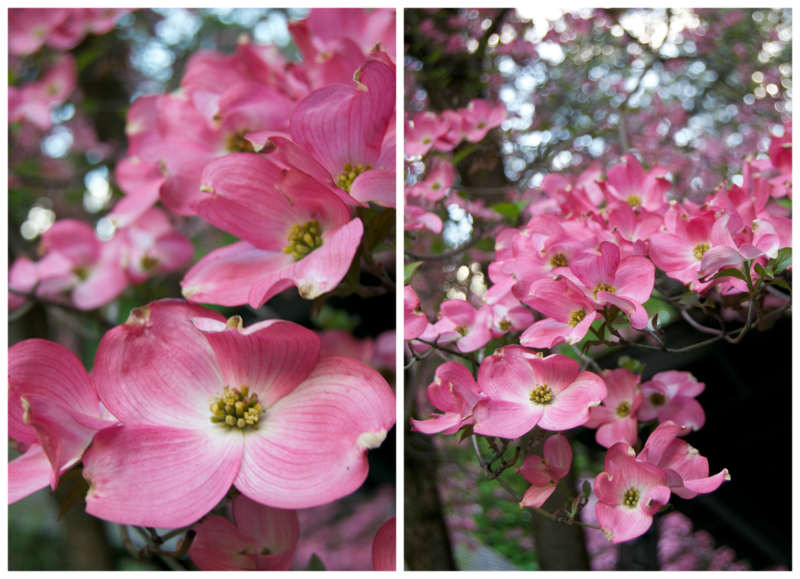 The dogwoods! 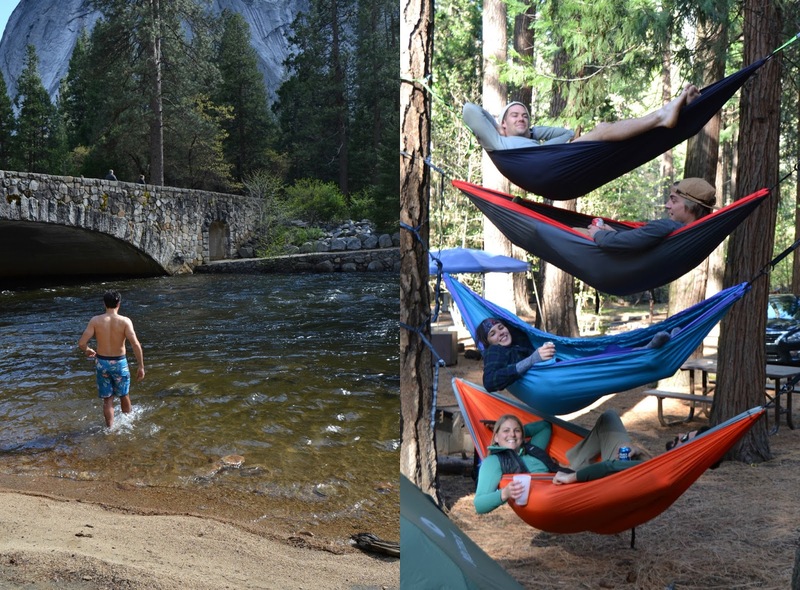 And those hammocks! 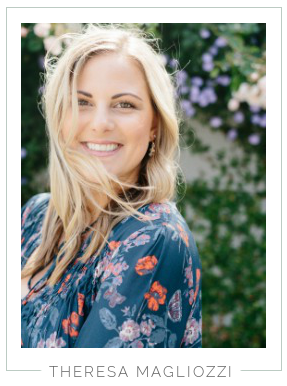 What an amazing trip, girl! The Camping Companion “bring way too much stuff” on typical trips. For a four to five day trip, one change of clothes will suffice. You also need a better-quality tent because “if it breaks, you can’t crawl into your car.” He recommends tents between 5 to 8 pounds versus the unwieldy 25-pound tents some people break out for car camping. From April through September, reservations are an absolute necessity at any of Yosemite's campgrounds. They as a rule top off by twelve at the most recent, so first-come, first-serve isn't generally a choice amid summer camping in Yosemite National Park. I find https://outdoordo.net this very good website for the best outdoor tips. You can visit this site. Camping in Yossemite Campground is always an interesting experiences!